Make a glass bubble stringer pendant by trapping air bubbles between stringers and a cap. Making these pendants is very quick and easy. This style of bubble creation can be used in larger fused glass items such as coasters, plates, bowls, etc. 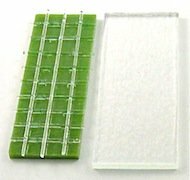 This item is made from stringers laid across a base glass, which is then capped with a clear or transparent cap and fired in a glass fusing kiln. Instead of a clear cap, a transparent cap can be used over a clear base or the same transparent color. Colored stringers may also be fitted. There is no set size for this item. Either Bullseye Coe 90 or System 96 is suitable for this project. Fuser's glue or white glue. The stringers are laid out in squares on the base; a nice even size to work with is one inch by two inches, which will allow for 1/4 inch squares. 1. Cut base to size, suggested size one inch x two inches. Cut clear or transparent cap about 1/8 inch larger all round. 2. Cut stringers to size for base, stringer ends should be even with base edges. 3. Measure base for 1/4 inch squares. Use a small drop of glue and glue short stringer pieces to base surface. When dry, glue long stringers over small stringers as per the photo. 4. Once glue is dry place clear cap over stringers. 5. Place on prepared shelf and load into kiln. 6. Bring temperature up reasonably quickly to 1000° F (540° C) hold for five minutes. Raise temperature up to about 1500° F (816° C), hold for 15 minutes. 7. Check bubble formation on pendant, if not fully formed hold longer until bubbles are more defined.